You have to hand it to Dead Space, it's a franchise that knows how to sell out with style. Games, comic books, movies, toys, clothes -- Visceral's action-horror franchise is committed to flooding you with as much stuff as possible. A mobile game was inevitable, with this in mind. However, Dead Space for the iDevices is no mere cash-in. Rather than go the easy route with an on-rails shooter or a selection of banal minigames, Electronic Arts and IronMonkey Studios have instead opted to cram a genuine third-person Dead Space experience into your iPhone. The weird thing is ... it more or less works. 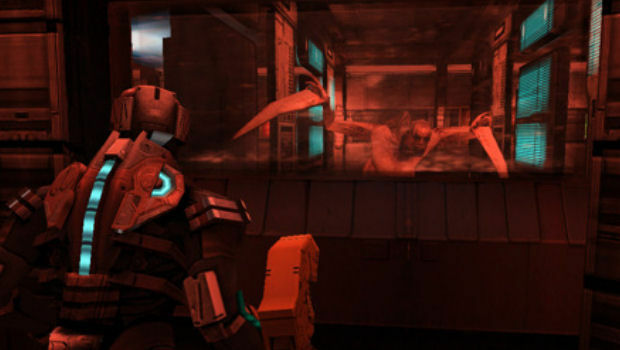 Dead Space iOS (which I'll just call Dead Space from here on out) bridges the gap between the first console installment and the second. 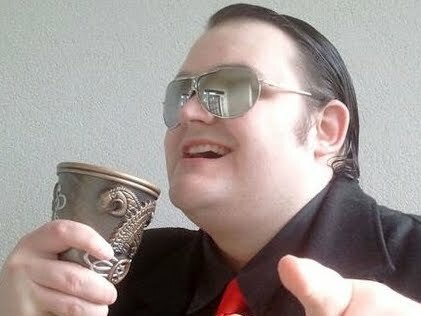 Stepping into the magnetic boots of the mysterious Vandal, players start out as a thrall to the franchise's primary non-mutant antagonist, the Church of Unitology. Naturally, the twisted, slavering Necromorphs arrive to ruin everything, and Vandal finds himself in a situation that he helped to create. Dead Space's story is impressively presented, with some solid voice acting and decent dialog, although it relies too heavy on plot twists, none of which are very surprising at all. You'll see the major "shocker" long before it's revealed, and the only thing you'll be confused about is why Vandal is such a naive idiot. Nevertheless, it's a fairly fun romp that doesn't really bring anything new to the overall story, but certainly doesn't offend, and there is a little surprise at the very end that -- while done before -- ought to make you smirk. 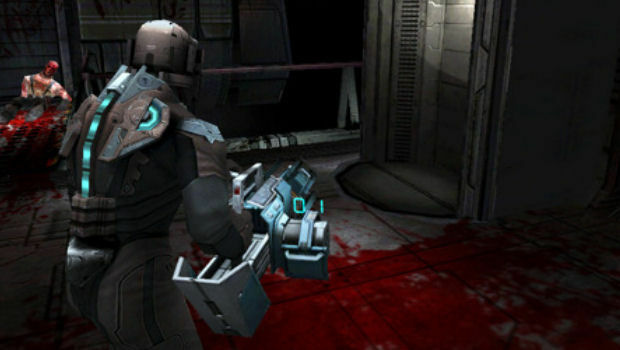 As stated at the top of the review, Dead Space attempts to be a fully-fledged console experience on a small touchscreen. Vandal will essentially do everything that Isaac Clarke can do on the Xbox 360 and PlayStation 3. Expect to cut away Necromorph limbs, stomp on bodies, upgrade your equipment, stick to walls in Zero Gravity, and use telekinetic powers. It really is impressive just how authentic a Dead Space experience has been crafted, and the generally high caliber of the game could at least justify an XBLA/PSN port. Of course, with such a wide array of features comes a set of control problems, but not quite as many as you might think. Swiping the left side of the screen gets Vandal moving, tapping on the right side lets him aim and fire, and you'll be touching the weapons to reload while tapping Vandal's back to shoot a slow-down blast at enemies. In addition, you'll swipe upwards or downwards on a contextual prompt for close-combat attacks, and tap various icons to telekinetically pick up objects. The interface definitely takes getting used to, as there's a lot to take in and the game doesn't exactly keep its combat slow-paced. There are also many instances where the controls become confused -- for example, the game frequently finds it difficult to tell when you've tapped on a door to open it, and instead makes Vandal aim his weapon. He'll often fire his gun when all you wanted to do was reload, and believe me, you don't want to waste a single bullet. For some reason, ammo is scarce in this mobile title, even by the standards of the franchise. Far too frequently, Vandal is left with barely any firepower in his inventory. Most encounters with the Necromorphs completely drain supplies, and I even ended up in a boss fight with only the close-combat plasma saw at my disposal. 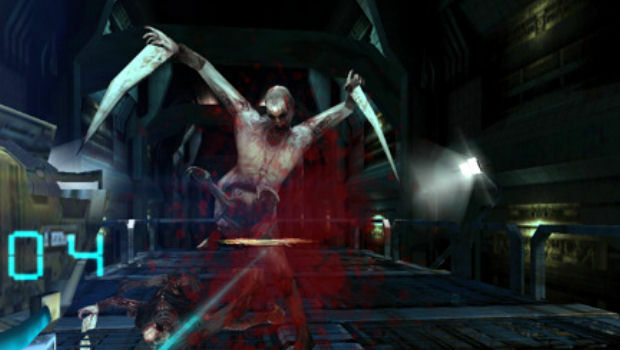 Perhaps because of this plasma saw, EA Mobile figured bullets weren't as necessary, but since getting close to a Necromorph usually means you'll be trading damage with it, getting close is never advised. The game is generally well paced, but there are a few aggravating choke points and slow sections that bring it down. The Zero G areas, in particular, are fairly dull. It's also quite annoying to have to shake the iPhone in order to make Vandal perform a boost jump. On the whole, the game maintains just the right amount of action, but be wary of the occasionally insipid intermission. If you can get used to the spotty controls and a silly lack of ammo, Dead Space is a great little mobile game that is well worth playing. Even with its input flaws, it's still remarkable just how much effort went into the game, and how many features from the console versions have been recreated. From Workbenches to Stores, to an almost full range of varied Necromorph enemies, there's a staggering amount of quality content in there. This mobile spin-off packs some pretty good visuals, obviously not comparable to something like Infinity Blade, but most certainly some of the better looking 3D graphics on the mobile gaming market. No Dead Space would be complete without some excellent audio either, and this title delivers, with eerie sound effects, ambient noise and perfect musical interludes as and when needed. The richness of the sound really helps to hammer home just what a complete and polished experience has been created. 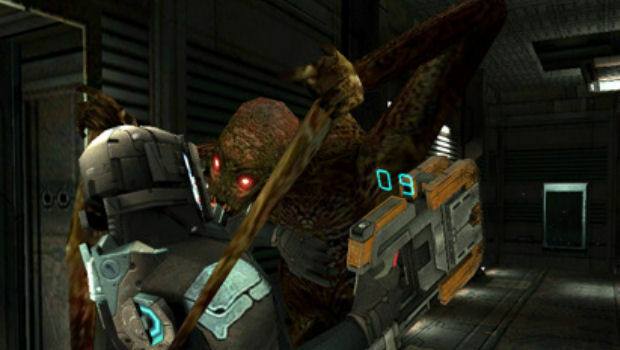 Dead Space will take around three hours to complete, with an obligatory "New Game Plus" mode and an unlockable Hard Mode to keep things replayable. If you can't get enough of the game, there is of course plenty of DLC to purchase already -- including attack/armor upgrades and extra Power Nodes to customize your character. Rather greedy and grasping of EA, but you know how they roll by now. Dead Space takes some getting used to on a touch screen, but once you get the hang of it, this is an impressive title that preserves the sense of panic and action from its bigger budget brethren and gives fans of the series even more quality action horror enjoyment. 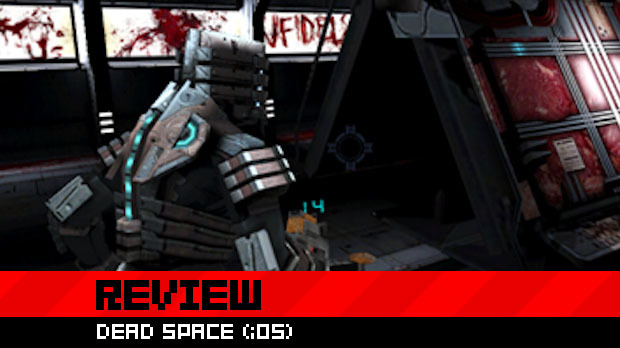 A definite must-have for Dead Space lovers, and worth checking out for the more casual mobile gamer, Dead Space is a great title that blasts through its interface issues to prove that console experiences can work on a mobile phone ... provided you've got the patience for it.